Note: The Gaussian distribution is not a commonly used severity distribution. It is used in this example primarily to illustrate the concept of parameterizing a distribution such that it has a scale parameter. Although the distribution has a support over the entire real line, you can fit the distribution with PROC SEVERITY only if the input sample contains nonnegative values. The following statements use the alternate parameterization to define a new model named NORMAL_S. The definition is stored in the Work.Sevexmpl library. An important point to note is that the scale parameter Sigma is the first distribution parameter (after the 'x' argument) listed in the signatures of NORMAL_S_PDF and NORMAL_S_CDF functions. Sigma is also the first distribution parameter listed in the signatures of other subroutines. This is required by PROC SEVERITY, so that it can identify which is the scale parameter. When you specify regression effects, PROC SEVERITY checks whether the first parameter of each candidate distribution is a scale parameter (or a log-transformed scale parameter if dist_SCALETRANSFORM subroutine is defined for the distribution with LOG as the transform). If it is not, then an appropriate message is written the SAS log and that distribution is not fitted. The sample is simulated such that the regressor X2 is linearly dependent on regressors X1 and X3. The "Model Selection" table in Output 23.2.1 indicates that all the models, except the Burr distribution model, have converged. Also, only three models, Normal_s, Burr, and Weibull, seem to have a good fit for the data. The table that compares all the fit statistics indicates that Normal_s model is the best according to the likelihood-based statistics; however, the Burr model is the best according to the EDF-based statistics. This prompts you to further evaluate why the model with Burr distribution has not converged. The initial values, convergence status, and the optimization summary for the Burr distribution are shown in Output 23.2.2. The initial values table indicates that the regressor X2 is redundant, which is expected. More importantly, the convergence status indicates that it requires more than 50 iterations. PROC SEVERITY enables you to change several settings of the optimizer by using the NLOPTIONS statement. In this case, you can increase the limit of 50 on the iterations, change the convergence criterion, or change the technique to something other than the default trust-region technique. Needs more than 50 iterations. The results shown in Output 23.2.3 indicate that the Burr distribution has now converged and that the Burr and Weibull distributions have an almost identical fit for the data. The NORMAL_S distribution is still the best distribution according to the likelihood-based criteria. The comparison of the PDF estimates of all the candidates is shown in Output 23.2.4. 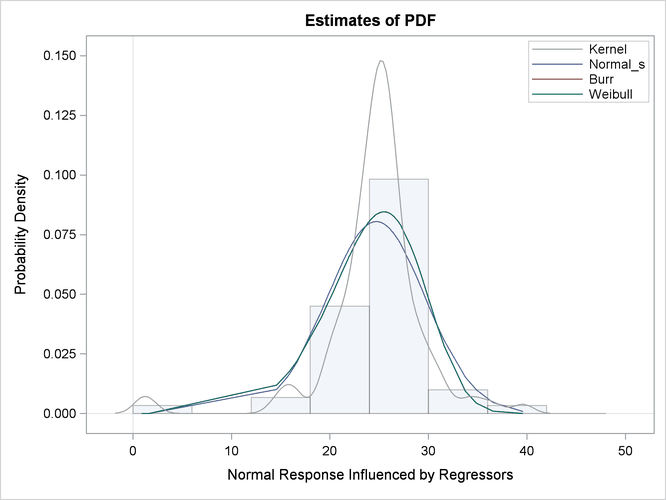 Each plotted PDF estimate is an average computed over the N PDF estimates that are obtained with the scale parameter determined by each of the N observations in the input data set. 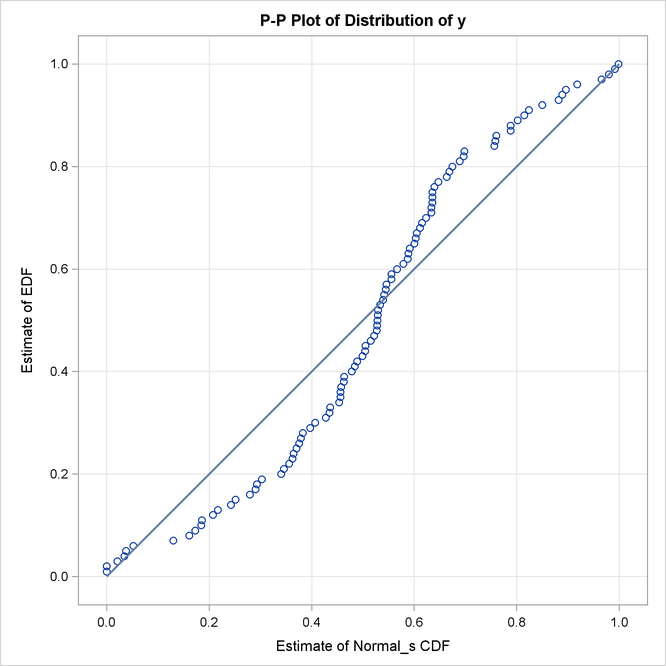 The PDF plot shows that the Burr and Weibull models result in almost identical estimates. All the estimates have a slight left skew with the mode closer to Y=25, which is the mean of the simulated sample. The P-P plots for the Normal_s and Burr distributions are shown in Output 23.2.5. These plots show how the EDF estimates compare against the CDF estimates. Each plotted CDF estimate is an average computed over the N CDF estimates that are obtained with the scale parameter determined by each of the N observations in the input data set. Comparing the P-P plots of Normal_s and Burr distributions indicates that both fit the data almost similarly, but the Burr distribution fits the right tail slightly better, which explains why the EDF-based statistics prefer it over the Normal_s distribution.